California employers are required by law to provide workers’ compensation insurance. If you are injured on the job, regardless of fault, you are entitled to benefits as described by the workers’ compensation law. There are five main workers’ compensation benefits available to injured workers: medical care, temporary disability, permanent disability, vocational rehabilitation and death benefits. You cannot bring a lawsuit against the school district for a work injury. You will need legal assistance to ensure that you are treated fairly and know your legal rights. You are covered by workers’ compensation insurance when you are injured at work or suffer an occupational disease. Psychiatric injuries due solely to job stress do not qualify for benefits unless you worked for your employer longer than six months. If you wait until after your notice of job termination to report an injury or illness, you may not qualify for compensation. You have the right to file a Doctor Preference Form with the District yearly. 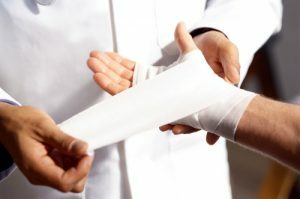 It is highly recommended that you advise the District in writing before an injury, that if you are injured on the job, you wish to be treated by your personal physician. The primary treating physician is the doctor responsible for managing your care, and providing an opinion on your medical condition to determine your eligibility for compensation. The opinion of the primary treating physician is most important in awarding benefits. If you have not pre-designed a primary treating physician, the District can require you to see a District-appointed doctor for your first 30 days of treatment. If you are injured, you should seek medical care immediately. You should CALL TALB as soon as possible and we will make sure that you have a Workers’ Compensation lawyer. It is in your best interest to talk to an attorney as soon as possible to determine whether to make a claim. Report your injury or occupational illness to the administration at your school site. Never argue with school administrators about your workers’ compensation benefits. Your claim is processed by an independent adjusting agency. Other school employees have nothing to say about it, one way or the other. They often misunderstand the law, and may give incorrect advice. Do not try to deal with a claim’s examiner on your own. They are experts employed by the insurance company or the school district and do not represent you. CTA has legal experts who do not work for the District and who will work to protect your interests.